The Aveda Speed of Light Blow Dry Accelerator Spray is a multi-purpose blow dry primer that perfectly preps hair for styling and minimises blow dry time. 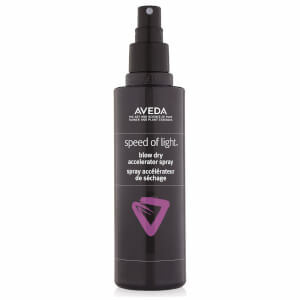 90% naturally derived*, the blow dry spray expertly detangles locks and protects against thermal damage while encouraging a fast and easy blow dry. Lactic Acid from Sugar Beets smoothens and seals cuticles to enable enhanced fibre separation for quicker blow drying, while a Corn-derived humectant moisturises to keep hair feeling nourished and protected. Also contains Coconut-derived conditioners to help reducing breakage during blow-drying by 93%**. 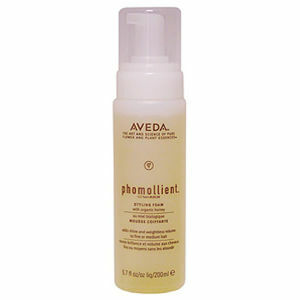 After use, hair is left primed for styling; soft, smooth and static-free. Infused with the brand's pure-fume™ aroma with certified organic Mandarin, Star Anise, Ylang Ylang and other pure flower and plant essences. **Based on a repeat grooming study with brushing and blow drying. Shake well. Section clean, towel-dried hair into quadrants. Spray each section until saturated. Comb through. Other prep or styling products may be applied at this point. Blow-dry hair. Alcohol Denat., Water\Aqua\Eau, Isohexadecane, Isododecane, Propanediol, Cetrimonium Chloride, Lactic Acid, Tocopherol, Polyquaternium-10, Fragrance (Parfum), Farnesol, Eugenol, Linalool, Benzyl Salicylate, Citronellol, Citral, Limonene, Benzyl Benzoate, Geraniol, Cinnamyl Alcohol <ILN44648>.